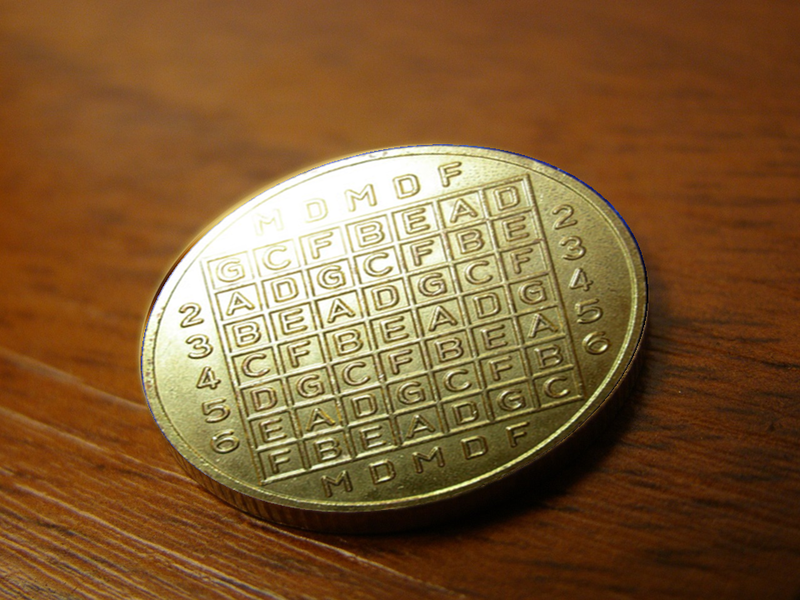 Here’s another unsolved crypto mystery that was provided to me by a reader of this blog. 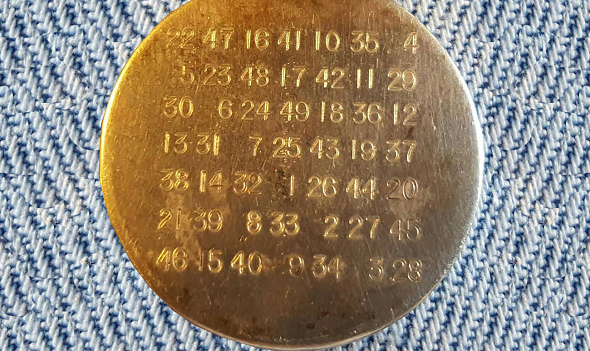 A reader, who is interested in coins and medals, recently sent me an email, telling me about a medal with strange inscriptions she came across on the internet. 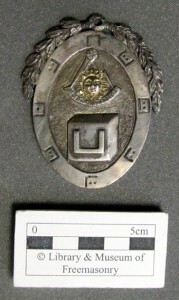 She doesn’t remember exactly where she saw it, but the users of a web-forum told her that pictures of a medal of this kind are available on a Swiss website. I looked at the pictures, but I couldn’t make any sense of the medal inscriptions. 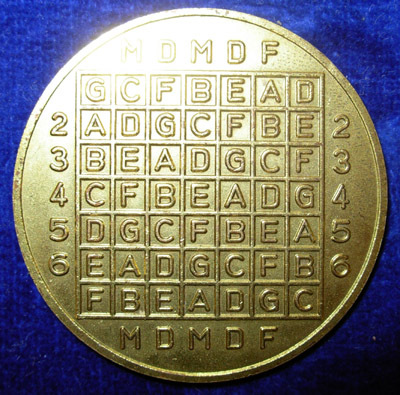 The Swiss website with the medal pictures is operated by crypto and mathematics expert Didier Müller, with whom I had the pleasure to exchange a few mails, when I wrote my steganography book Versteckte Botschaften a few years ago. 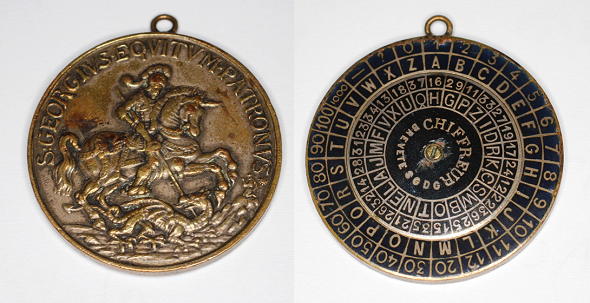 I contacted Didier, and he told me that he didn’t know anything about this medal and its inscriptions either. However, he allowed me to use his pictures on my blog. So, I decided to ask my readers. As can be seen, the inscription mainly consists of a seven-by-seven letter matrix. Only the letters from A to G appear, which means that an alphabet of seven letters is used. The digits on the left and the right are line numbers (from 1 to 7, with the first and the last number omitted). A possible interpretation of MDMDF is: Montag, Dienstag, Mittwoch, Donnerstag, Freitag (i.e., the days from Tuesday to Friday in German). The letters standing for Sunday (first column) and Saturday (last column) are omitted. 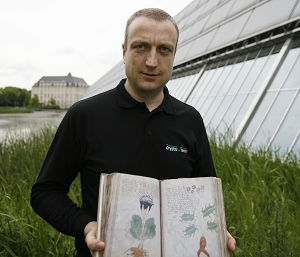 … the number seven plays an important role, too. The inscription shows a circle divided into seven segments. The number 3.25 is roughly (but not exactly) 24/7. 6.51 is close to 24*2/7, 10.17 is close to 24*3/7, and so on. The inscription almost looks like the dial of a clock that divides the day into seven time units. 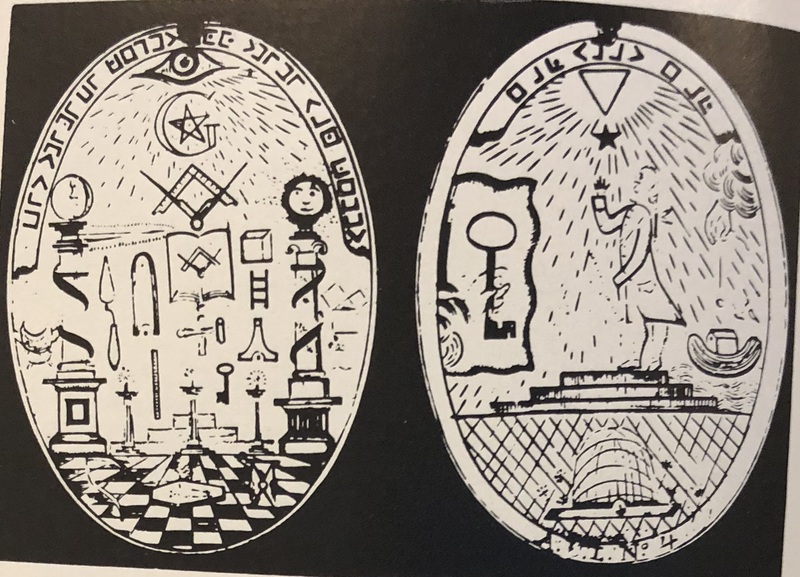 What do the inscriptions mean? 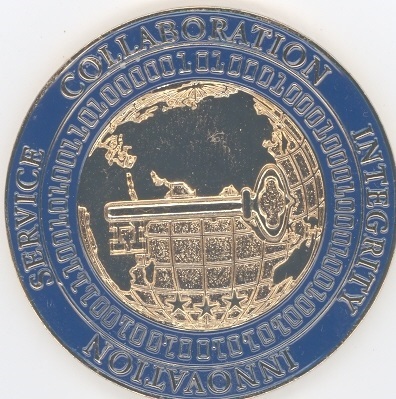 As can be seen, there are quite a few medals and coins that involve cryptography or steganography, but there’s no obvious relation to the medal shown above. Can a reader make sense of the two inscriptions anyway? Next comes the vital hour cycle in the lotus theory. The time of birth determinesthe vital hour cycle which is also under the influene of any one of the 7planets. The vital hour is fixed and does not change. And it does notcorrespond exactly to the Hora system followed in astrology. In this theory 24hours of the day is divided by 7 planets and each planets shares a duration of3 hours 25 minutes. Rahu and Ketu are excluded in this system. In this way every person is under the influence of two major planets. One planetdetermines the planetary constitution by the day of birth and the second planetis determined by the time of birth. The second planet is called the vital hourplanet. Both day of birth and time of birth are essential for astrologicalwork. Similarly in lotus theory also the day and time of birth indicate theplanets under whose influence a native will lead his life. The letters follows a pattern: Going from right to left, and skipping every other space, you get ABCDEFG. I agree that this looks like some sort of calendar. An idea regarding the numbers: they are hours and minutes, not decimal hours. So for example 6.51 means 6 hours and 51 minutes. Then the math adds up much better. But why would somebody divide the day into seven units? Your guess was correct. And the reason is, apparently, to assign one each of seven planets to each time segment, so that a certain planet would be represented by the time you were born. I was born on a Sunday, so I am in the first column, and so with the the 6th row for “Jupiter”, my letter is “E”. I feel more like a “G” today, but whatever. This is the system described by the Rosicrucian author Harvey Spencer Lewis in “Self Mastery and Fate with the Cycles of Life” (https://www.rosicrucian.org/rosicrucian-books-self-mastery-and-fate-with-the-cycles-of-life). 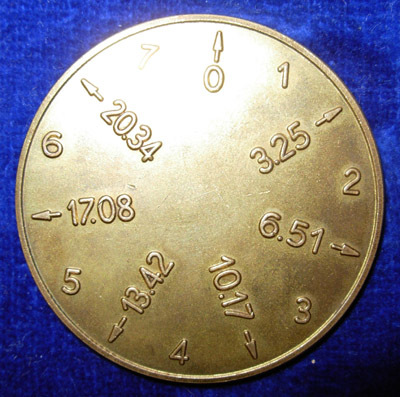 Since MDMDF is assigned to the days, the medal was produced for German speaking people. Perhaps the dial part is about when to skip a year in the top part? Why interesting? Since Lewis divided 24 hours by 7, each period lasts approximately 3 hours and 26 minutes (there is no period of length 3. 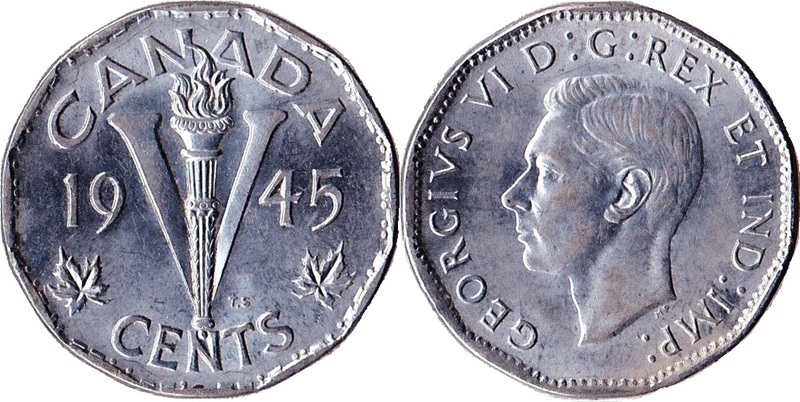 66).